These Medieval restraint devices are all working copies, as well as being great conversation pieces. We offer Medieval Whips and Locks. 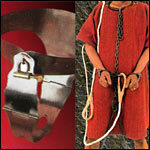 We also have medieval dungeon chains, locks, hand cuffs, chastity-belts, ropes, and leg irons. They can be used for re-enacting, living history events, or museum displays. Our Ball And Chain is the real deal and are made of mild steel and left in its natural state so it shows some minor wear and light rust as if a prisoner had just turned it in after their sentence was up. The ball weighs approx. 4-3/4 lbs and the steel chain and manacle (with key) are approx. 1-1/4 lbs. Ball and Chain with Shackle makes an impressive display. Great for museum displays, re-enactment use and living history events. This ball and chain shackle has an iron ball and a blackened steel shackle and chain. Key is removable. The Cat-O-Nine Tails is a type of multi tailed whipping device that originally used as an implement for severe physical punishment. Our Cat-O-Nine Tails is a quality little Leather Whip. Overall length 21 inches. This set of Prison Keys Includes five brass keys and key ring. Our Deluxe Chastity-Belt may be the finest example of a medieval chastity-belt one could own. Completely hand hammered and finished in the same manner as medieval armor. Every edge rolled for comfort. Custom made to fit. Our Deluxe Linked Medieval Handcuffs replicate the originals that were in use during the Middle Ages. Our Medieval Dungeon Leg Irons make a most impressive display. Great for museum displays, re-enactment use and living history events. Hand forged heavy prisoner irons include a hinged neck ring, chain and two Leg Irons with ankle rings. Our Male Medieval Handcuffs are Fully Functional, forged from steel, solid and include a key. These Medieval handcuffs are working copies, great conversation pieces and will work for many time periods. Our Heavy Prisoners Rope is great for museum displays, re-enactment use and living history events and of course tying up your medieval prisoners. Each rope comes with the ends sewn into loops for a wide variety of uses. The Medieval Dungeon Padlock, from treasure chests to dungeon chains, one thing was for sure - a strong lock like this one was needed to keep property safe and prisoners secure. This working reproduction, medieval lock has been antiqued and hand made so it looks and functions as the originals did. Whether it’s the Tower of London or the famous Bastille, your only means of escape would be to steal the jailer’s keys. This great set of antiqued keys has been forged in metal like the originals and is a great conversation piece or accessory to an outfit. War was an inevitable part of the Middle Ages and Renaissance. And this kit would have been designed for those bloody battlefields. Each piece in this kit is hand forged entirely in carbon steel, and weathered to look as authentic as possible. Giant Round Medieval Dungeon Padlock. This ancient style of round or pancake lock was in use for hundreds of years. An ideal way to keep your riches or captive secure. All steel construction. Each is hand made to look and function as the originals. Our all steel Medieval Chastity-Belt is fully functional and can be worn. This Chastity-Belt does not include a lock but is perfect for a display piece. Our Fully functional Medieval Female Handcuffs are just the thing to keep your medieval maiden captive. The Medieval handcuffs are working copies, great conversation pieces, fit many time periods. Keep your prisoner firmly attached with our wrist manacles! Fully functional, includes key. These Medieval cuffs are working copies and make great conversation pieces. Great for many time periods this handcuff is crafted from steel. Medieval Ornate Lock really works and is perfect for locking your medieval chests and strong boxes. Hand made from steel with medieval design carved on the lock. Each chest lock come with a key. Suitable for Renaissance and Pirate eras. Top Grain Leather Bullwhip Brown Accent Medium - Spanish leather bullwhip, extremely durable, suitable for professional - recreational use. Leather Whip is appx. 6 feet and will produce a loud crack. Cord cracker is replaceable. Split Hide Bullwhip Black Large - a split-hide Spanish bullwhip excellent for recreational use. This Whip is approx. nine feet long and can produce a loud crack. The cord cracker can be replaced when worn out. Length is Approx. 100 inches. Our Split Hide Bullwhip Black Medium a split-hide Spanish bullwhip excellent for recreational use. Leather Whip is approx. five feet long and can produce a loud crack. The cord cracker can be replaced when worn out. Approx. 75 inches. Top Grain Bullwhip Brown Mini - These top-grain Spanish leather bullwhips are extremely durable and suitable for professional or recreational use. Approx. three feet long and will produce a loud crack when handled correctly. Approx. 40in. Have you been looking for the right period Iron Lock for that strong box or jail cell? Western enthusiasts and re-enactors, you're in luck. Made just like the originals, lock measures 2 1/2 inches x 3/4 inches. HHave you been looking for the right period Iron Lock for that strong box or jail cell? Western enthusiasts and re-enactors, you're in luck. Made just like the originals, lock measures 1-3/4 inches x 4.25 inches. Small lock also available. These full size old time leg irons are made just like the originals from iron. Great for the western enthusiasts or re-enactors. They include the key. These leg manacles are crafted from iron and are locked onto a bar with functional iron padlock which is included. The small keys lock and unlock the padlock. Our fully functional Medieval Handcuffs are just the thing to keep your medieval maiden captive. These Medieval handcuffs are working copies, as well as being great conversation pieces. Great for many time periods our handcuffs are comfortable and hand forged from steel. They include a key. Medieval Leg Manacles are great for museum displays, re-enactment use and living history events. These leg manacles are crafted from iron and are locked onto a steel bar with small padlock. The small keys lock and unlock the padlock.